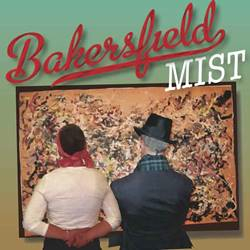 To pirate an old adage ... beauty, art, and value are each in the eyes of the beholder, and nowhere is that more true than in New Century Theatre’s lively production of Stephen Sachs' "Bakersfield Mist." Ellen Barry and Richard McElvain play the two combatants on this field of clashing perceptions of that age-old debate over what is art? Maude Gutman, a salty tongued trailer park collector of anything 'art-sy' ( as demonstrated by her immense collection of dumpster diving acquisitions), claims to have found an undiscovered painting by Jackson Pollock. Lionel Percy, art historian and self-proclaimed "connoisseur," can't quite bring himself to declare the find the real thing, despite the evidence to the contrary. What follows is as artistic and entertaining debate/knife wielding scuffle as the art world has seen over what is either a four by four foot piece of someone's painting drop cloth, or the genius of one of art's greatest contemporary masters. Like Pollock's work, the script provides lots to see and hear with the verbal jousting going from passionate and soaring dissertations on both sides, to crude and sometimes cruel diatribes lobbed like hand grenades. In the process, not only is the ethereal veneer of art clawed away, but that of the combatants as well, as their real life successes and failures, personal and professional, are exposed to the raw light cast by another's critical eye. In the end, the debate of what is art may not end up being what you think it might be. What is true, is that the artistry of the author, director and cast is unquestionably the real thing.